The Syro-Malabar Church has been sending priests, and religiouspersons to look after the Syro-Malabar Catholics, who have settled outside its ?territorium propirum? with a view that its sons anddaughters in the Diaspora practise their religious life, with its own liturgical and spiritual traditions. After the years of Indian Independence, educated men and women as well as students of higher Education from Kerala, the most literate State in India, have migrated in search of job and more qualified education, to Delhi. In the 1970s and in the 1980s, as the presence of the Syro-Malabar Catholics in Delhi increased towards the formation of innumerable communities, various Religious Congregations have begun their pastoral activities in the region. In1986, on request of the Syro-Malabar Bishops? Conference, Fr.Sebastian Kizhakkeyil MST worked in Faridabad, at the place where the present Cathedral is situated. He was succeeded by Fr. James Mandapathikunnel MST. Later, in view of a more coordinated functioning, the Syro-Malabar Bishops? Conference hasentrusted the Delhi Mission to the Archdiocese of Ernakulam. In 1991,Fr. 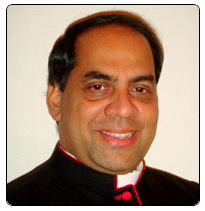 Sebastian Vadakumpadan was appointed as the Chaplain of the Delhi Syro-Malabar Catholics. In 2003, Episcopal Vicar, Fr. George Manimala was in charge of the Syro-Malabar Community. In December 2004, Fr. Jose Edassery was appointed the coordinator of the Delhi Syro-Malabar Mission. During these periods, the Delhi Syro-Malabar Church achieved speedy growth with a great number of individual parishes and Mass Centres sanctioned by the Archdiocese of Delhi. Syro malabar population 100,000 c.